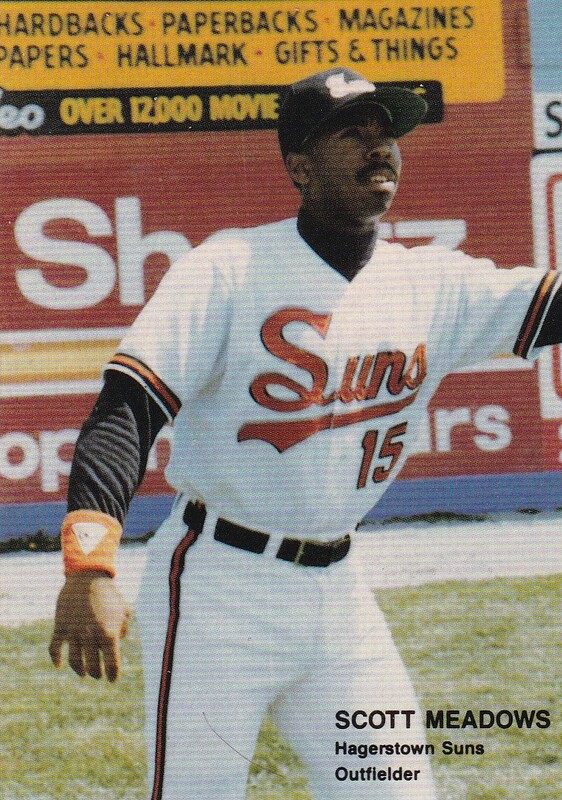 Promoted to AAA Rochester in mid-May 1991, Scott Meadows took off, The Baltimore Sun wrote. He'd been told not to get comfortable, the call-up was only temporary, Orioles GM Doug Melvin told The Sun. But a .357 average helped make his case to stay. "I was upset I didn't come here right out of spring training," Meadows told The Sun. "I know I can play at this level." While Meadows knew, and proved, he could play at the AAA level, he never got the chance to prove he could play at the major league level. In a professional career that spanned seven seasons, Meadow never got called up to the majors. Meadows' professional career began in July 1988, signed by the Orioles as an undrafted free agent out of Ohio State. With the Buckeyes in his hometown, Meadows won All-Big Ten honors in 1986 and claimed the school's season hits record in 1988, notching his 72nd by May 14, The Associated Press wrote. Meadows played that first season, eight games, with single-A Hagerstown, going 3 for 8. In 1989, he stayed at single-A, playing at Frederick co-op Waterloo. He hit .291 between them with 47 RBIs. Meadows jumped to AA for 1990, going back to the now higher-classified Hagerstown. There, he hit .293 with 75 RBIs. By May 11, Meadows lead the league in both categories, The Schenectady Gazette wrote. Meadows returned to Hagerstown for 33 games in 1991, then made the jump to AAA. At Rochester, Meadows hit .329 with five home runs and 42 RBIs. He hit one of his home runs in a July contest. Meadows's arrival, along with that of teammate Jack Voigt, rejuvenated Rochester, Rochester manager Greg Biagini told The Sarasota Herald-Tribune in July. That offseason, Meadows looked to build upon his success and went to winter ball in the Dominican Republic braving the differences between playing ball there and in the U.S., The Sun wrote. "Driving is insane," Meadows told The Sun of the Dominican Republic. "Especially at night. The lights are out half the time, and people just make their own way. The police are looking to stop you. The thing you learn is, just keep going. And if they stop you, don't give them your license. It'll cost you at last 200 pesos to get it back." Coming back for 1992, though, the stint in winter ball didn't seem to help. His average at Rochester dropped to .264 and he only knocked in nine in 216 at bats. Meadows was sent back to AA. "Hitting him in the middle of the order most of the year, we counted on him to drive in runs," Rochester manager Jerry Narron told The Sun after demoting Meadows. "He just hasn't done it." With the demotion to Hagerstown, though, Meadows, started hitting again. By Aug. 9, Meadows was hitting .311 at AA, hitting .500 in one seven-game stretch, The Sun wrote. By the end, Meadows hit .317 for Hagerstown with 14 RBIs. But it was his final year in affiliated ball. Meadows went on to finish out his playing career with two seasons in independent ball, with St. Paul and Duluth.